Thanks for Experiencing Italy's Makers Italia Pavilion! we hope you had a good visit with our Italian makers who enjoy learning and sharing what they do best! We'd like to thank the show organizers, Maker Media, Inc. for bestowing us with a "Best Pavilion" award at this year's show. ​Atelier Guarotti is a start up that has set the goal of introducing modern 3D technologies in fashion haute couture. Unique pieces, bespoke, made at a distance by the best Italian tailors and shoemakers , through the use of 3D scanners for measurements, three-dimensional modeling software for "virtual" tests and the creation of bespoke models, the use of 3D prints to achieve three-dimensional quality control. The best Made in Italy craftsmanship tradition, available anywhere in the world. Cybertec Services Srl is an Italian company based in Rome. We have a clear and consistent vision with our goals: to bring man back to progress’s centre. All our projects have the aim of offering technology in a friendly and truly enjoyable shape. Established in year 2000, has started its activity in supplying services for studying, projecting and manufacturing shelters for radio base systems. In 2003, we started focusing on ICT with the Project ComputArte, a fusion between technology and Art. FABLAB CATANIA is a registered innovative startup founded in February 2014. The triggering idea was to combine production, innovation, research and social network by sharing professional expertise and advanced technological resources and tools. The company was created using an European funding, received by Invitalia. Product designers, 3D designers, electronic engineers, IT, graphic designers and illustrators make up the FABLAB team. Customer satisfaction is a key value for FABLAB. The company is continuously seeking for quality improvement of products and services offered in order to strengthen its footprint in the marketplace will increasing the number of available opportunities for its customers. FABLAB has a number of active agreements with high schools, cooperates with Architecture Department in University of Catania. FABLAB holds two patents registered in 2014 e 2015. FABtotum is a young company, born in 2013 from a project of two architecture students, Marco Rizzuto e Giovanni Grieco. Today the Team is composed by 10 members but the FABtotum, the multifunction 3D printer/CNC machine/Laser engraver has already been sold in over 65 countries worldwide. Fondazione Mondo Digitale (FMD) and Olivetti have brought didactic 4.0 to the United States. 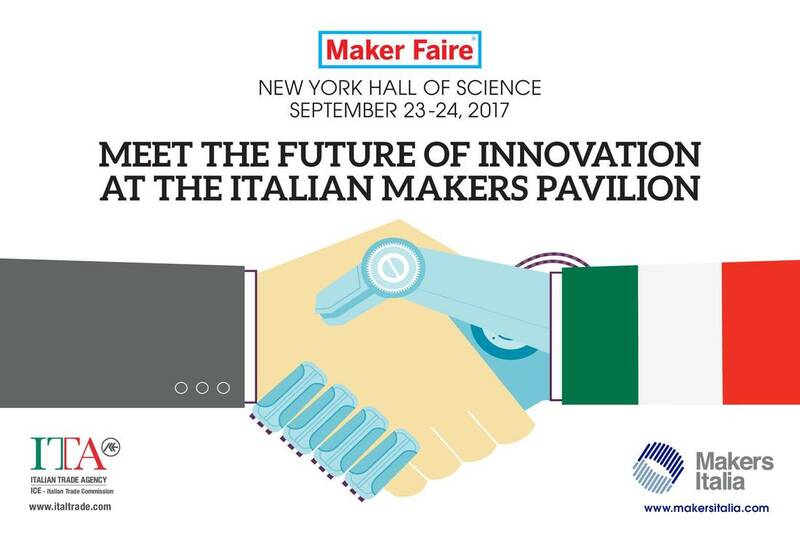 From open source IOT robot to self-produced laser book, mobile labs and 3D printers, the Made in Italy "will be teaching" at the Maker Faire in New York. As part of the new creative school workshops, FMD and Olivetti present products, projects and digital learning environments of the Innovation Gym, which successfully employees the "Education for life" model. Fonderie Digitali Rete di imprese White3 s.r.l. Fonderie Digitali is a network of companies that brings together the most daring and innovative realities of digital fabrication in Italy and Europe. Fonderie Digitali was born from the union of the most dynamic digital factories in the Italian panorama: Solido3D and White3. These companies represent a natural point of reference in the world of a maker’s economy and Italian startups. Fonderie Digitali has built a community of companies and professionals, which build successful products and develop avant-garde technologies. Building systems and next-generation products for command and control, supervision, monitoring and analysis. Using internally developed and third party technologies to simplify human-machine interaction. A revolutionary approach to complex systems so to give users an empathetic way of interact with data visualized by the interface. Bring in enterprise environments different ways of interaction with data and systems, like mime and gestures. Evolving along with the world. Experimenting research and new technologies to offer cutting-edge solutions. Always representing the Next Step. Graduated in Interior Design and with a master in Digital Architecture, Jessica collaborates with some architectural practices. In 2014 she started her personal research on design and self-construction, designing two models of FDM 3D printers, and experimenting with the possible interactions between digital (3D printing, laser cutting, CNC milling) and traditional crafts (sewing, woodworking, ceramics) aiming to realize products born from the combination of different techniques and materials. ​Morpheos is an innovative startup focused on industrial research, hardware and software development. Thanks to the insight and research of its highly-motivated founders, Morpheus brings together a varied and dynamic team to apply their know-how to the IoT sector. The research conducted by Morpheos in the field of technology equipped with Artificial Intelligence, applied to web sites and Robotics applied to household furnishings, with the objective of increasing their usefulness and optimizing their energy use, led to the creation and subsequent development of the «Momo Project». Next Industries is a 2014 Company born to develop smart devices and sensors provided with IoT Technology, made by technological highly skilled people, who are expert in vibration detection for big structural monitoring systems in bridges, tunnels, undergrounds, dams applications and so on. Devices developed by Next Industries communicate with Cloud through wireless connectivity and are able to manage alarms/notifications, thus being smart and transforming the way you work, live and connect to the world as they fit both for indoor and outdoor installations. Born in 2014, weAR, an italian startup innovative company, supported by Aruba Spa, Club Italia Investimenti 2 fund and Digital360.it accelerator delivers a new generation of user-generated manuals, accessible with mobile and wearable devices easily and fast through augmented and mixed reality. The Italian Trade Agency is the Italian government agency committed to the internationalization and competitiveness of Italian companies. ITA’s mission is to create strong, sustainable trade relations though the facilitation of information, support and guidance to Italian and foreign companies. The Chicago Office follows the Italian Makers Movement in the US. The Italian Maker Pavilion / Stay Tuned! We'll Be Updating Regularly!